Drew Forrest’s history of South African pacemen includes the famous, the infamous and those forgotten by the mainstream history. 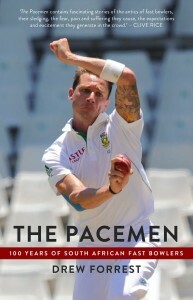 In this chapter, Forrest examines the life – and speed – of the “red-hot trundler” H “Krom” Hendricks, a cricketer from the 1890s who, because of racism and the machinations of the political elite associated with Cecil John Rhodes, was systematically edged out of the game – and never represented the country of his birth. By universal consent “Krom” Hendricks was the fastest bowler in South Africa in the 1890s, the decade before the country’s graduation to full test-playing status. His contemporaries described him as “a red-hot trundler” and “one of the finest extra-fast bowlers in the world”. Six feet two inches tall and capable of “sending down lightning deliveries all day without tiring” off a run-up of three or four strides – suggesting great upper body strength – he terrified the English professionals who toured South Africa under Walter Read in 1891/2. One of them, George Hearne, graphically describes the panic he struck into English breasts on a bad wicket: “We didn’t like facing the man at all. I was captain during the match and everybody began to ask me to let somebody else go in his place … [William Brockwell]… managed to slip off. He said he absolutely must go into Cape Town on business … and he went, coming back just after the game was over, cheerily waving his handkerchief. At the match at Newlands, the crowd was heard to gasp in astonishment after Jack Hearne, “who had been very venturesome, had his off stump shot some yards out of the ground in trying to drive a fast ball from Hendricks”. Despite his pace and hostility Hendricks seems to have been unusually accurate. Bowling for an All Comers XI against the Western Province Cricket Club in October 1897, he took eight for 32 – seven of them bowled. Yet in an ironic precursor of the 1970s and 1980s, when white cricketers were forced to the margins, he never represented the country of his birth. No photograph of him exists, and almost nothing is known of his early life or his employment, except that he played for the Malay side, the Star of South Africa, throughout the 1880s and worked for a time as a professional cricket coach. Some sources render his first name as Armien, but they are confusing him with another Hendricks who played against Read’s team. The sports historian who has studied him most closely, Jonty Winch, gives his initial as “H”. After coming across “hundreds, if not thousands, of files for H Hendricks for that period” in the Cape Archives, Winch gave up trying to track down the details of his birth. Hendricks suffered from a fatal disability: he was what would be classed in the apartheid years as a “St Helena person”, confirming in a letter to the Cape Times that his mother came from the south Atlantic island while his father was “born of Dutch parents in Cape Town”. Although he played against Read’s side for a Malay XI – in the last match between players of colour and a touring squad for more than 80 years – he was quite adamant in his letter that he was coloured, not Malay, perhaps fearing religious prejudice as a further hurdle to advancement in a sport overwhelmingly dominated by white Anglo-Saxon Christians. In a sad and dishonorable sequence of events that set the pattern not just for cricket but for every sporting code in South Africa, Hendricks was dropped from the national side that toured England in 1894 after being initially included in the final 15, and then systematically barred from provincial and club championship cricket by a determined band of bigots in the Western Cape Cricket Union led by William “Joey” Milton, the parliamentary secretary of Cape prime minister Cecil John Rhodes. Rhodes, who relied on the political support of the Afrikaner Bond and financed the England tour, appears to have driven the policy. He would later tell English cricket administrator Pelham Warner: “They wanted me to send a black fellow called Hendricks to England … but I would not have it. They would have expected him to throw boomerangs during the luncheon interval.” The latter was a disingenuous reference to the boomerang-throwing exhibitions by Australian Aboriginals on a tour 26 years earlier. It is an interesting reflection on the Cape liberalism of the time that the pressure for Hendricks’s selection came largely from the pragmatic selectors and newspapermen of the Transvaal, and particularly the captain of the national team and the man who would have kept wicket to the coloured paceman, Ernest “Barberton” Halliwell. He and the first secretary of the South African Cricket Association (SACA), Harry Cadwallader, appear to have had one overriding concern – to select the strongest possible team and capitalise on the interest the English crowds were likely to show in a black fast bowler from the colonies. Former Australian captain Billy Murdoch, who had been among Walter Read’s visitors, commented that Hendricks “would have been a great draw. I feel sure he would knocked some of us and our pegs about on hard wickets.” In the event, because it lacked big-name players, the South African side aroused little public interest. Rhodes and his agents in the WPCU were not the only culprits – what is deeply baffling more than a century later is the failure of the cricketers of the time to defend the merit principle. Another leading batsman and later acting governor of Rhodesia, Murray Bisset, was repeatedly at the forefront of official blocking tactics. Sitting on Hendricks’s last known plea to join a white club in 1904, Bisset adjudged that there was “no doubt in my mind that on general principles, the application should not be acceded to”. Cadwallader would pay a heavy price for his sponsorship of Hendricks: squeezed out of his position as SACA secretary by the hardliners, he moved to the Transvaal and later died in penury. After his brief turn on the Western Cape cricketing stage Krom Hendricks disappears from the historical record – details of his later life and the date and circumstances of his death are lost, probably forever. In Cricket in Many Climes Pelham Warner noted the large number of “Malays” in the crowd at a match between Lord Hawkes’s team and the Western Province in December 1898. Many of them, recognisable by their red fez, “were engaged as bowlers by the clubs in Cape Town … Some of them bowl well and their keenness is beyond doubt,” he said. In the period after the South African War, Winch records, no cricketers of colour were left in the Western Cape leagues.